As a consequence, Edvard Grieg’s accompanying, nationalistic music and Ibsen’s other works are more frequently performed than his Peer Gynt play. In a typically courageous move that holds an audience rapt, the Arcola Theatre has brought to east London the prestigious Theater an der Ruhr’s pared-back version, performed in German with English surtitles. It’s a move in keeping with Ibsen’s own cross-European trajectory. 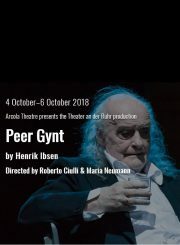 In 1867, he fled Christiania, now Oslo, to move to Italy and later Germany, where he embarked on his search for a Nordic Faust, resulting in the densely poetic Peer Gynt that combines Norwegian folk heritage and modern angst. The problem of unwieldy action spanning the globe is solved by the great European tradition of auteur directors that allows actors to take on authorial roles. Italian-born Roberto Ciulli, artistic director of Theater an der Ruhr, is one of the most renowned of our generation. Together with Maria Neumann, Ciulli divides up Ibsen’s innumerable parts and imposes simplicity and lucidity against an austere set of table, chairs, bed and cupboard that narrows a life of hope and sweep to the basics of birth, death and survival. We begin as life ends with silence and the two auteurs of their own lives leaning together on the table, hands held as if dead or asleep, then slowly looking up at each other with what is love or hate or indifference as the action unfolds. Initially both dressed in black suits and white shirts, they are old and asexual. Ciulli is every bit the mythical sprite with the remains of flowing silver locks that he tugs at coquettishly as he briefly plays the part of the mother of Peer Gynt, drawing out humour despite all the potential barriers of language and culture and the profound bleakness that pervades the text. Long before today’s Nordic noir, Ibsen is truly devastating. A hint of emotional richness is at once rekindled and mocked as Neumann emerges from the cupboard in camisole and curly wig to the music of Cohen’s Dance Me to the End of Love. The prevailing futility is summed up in such imagery as the quill that has never met a knife and therefore can never spill its ink into poetry and the grass that is crushed in vain by a life that ultimately leaves no imprint. Death is the moment of reckoning, especially for a writer powerfully wedded to a sense of self. Peer Gynt’s crimes are not even great enough to merit eternity in hell and instead, he should simply be smelted down as so much metal in a giant hot ladle. That is one image left to our fired-up imaginations, but the production also draws out the text visually as Neumann drinks in and spits out a bottle of red ink and bites into a peeled raw onion, gnashing away at the layers until she reaches in disgust the pulp and emptiness at the middle. In Transit : Poems of Travel	La Malady of Love, Katie Mitchell, Barbican Theatre. Review by Julia Pascal.